Do you have stubborn areas of your body that seem resistant to change? Confused about nutrition, which foods to eat & bombarded with conflicting weight loss information? Not getting the desired results from your current exercise regime? Would you like the support of a positive, like minded and proactive group? ​Its time for a change. Its time to uncover the truth about diet and exercise. Kick Start Fat Loss Club is a revolutionary new programme with weekly club workout and daily online support. Drop a dress size or more, Burn body fat, shape up and slim down, there is no calorie counting, daily points, faddy foods or complicated workouts. 30 minute educational and motivational group talk – Understand the KSFL diet plan, meal and recipe ideas, PLUS Confidence coaching keeping you on track and motivated. 30minute Fat Burning HIIT Workout – Research shows you don’t have to work out for hours at a time for the best results. 30minutes of the right exercise intensity will burn more body fat than hours of cardio or endless hours at the gym. The KSFL workout is not dancy or complicated it is an all ability interval workout with rest & recovery periods, perfect for beginners and regulars. Knowledge is power and KSFL will help you cut through the weight loss confusion with totally up to the minute diet and workout plan. To get the desired results a combination of correct nutrition, exercise at the right intensity, mindset coaching and motivation. KSFL combines all of these crucial ingredients for your success. All delivered in a friendly, supportive and positive group. If you want to lose 3lbs or 3 stone Kick Start Fat Loss will get YOU the Body of your dreams. ​Live the life you really want and feel amazing. Last year I was in denial about my weight and by September I realised I needed to do something about it or I would just get bigger. I was also very unfit. I had considered trying one of Kelly’s KSFL courses and I saw that one was starting immediately after my holiday, so I signed up for one before I had chance to change my mind. When I first saw the food list I wasn’t sure that I would be able to stick to it but decided I would give it my best shot as I had nothing to lose except my flab. I concentrated on the food I could have rather than what I couldn’t. I actually enjoyed the food and couldn’t believe I could eat so well, feel full and lose weight. Other diets I have done I have been hungry after a few hours and constantly thinking about food. I found the weekly meetings and Kelly’s enthusiasm for the plan very motivating. I even enjoy the HIIT class as Kelly changes it every week. I had hoped to lose a stone by Christmas and with Kelly’s support and encouragement, plus her exercise classes I lost 1 stone 8 lbs by the end of the course. KSFL has been the most successful diet I have ever done. I have done a further 2 courses this year and have lost a total of 3 stone. I am so glad that my friends talked me into going to Zumba classes otherwise I would never have discovered KSFL! I needed and wanted to make a change and thought giving on to one with Kelly a try for 4 weeks dedicated to me was worth trying. The weekly half hour phone call from Kelly was invaluable as I could discuss anything to do with the plan, from swapping foods to coping with strategies when socialising. I've never eaten like this plan advocates but it is easy and it works! Three protein rich meals a day meant that I don't feel the need to snack at all. I enjoy a much better diet and lifestyle due to this plan as I am more energised and sleep better and feel better - no more sluggishness nearly every day like before! I do still like a glass of wine when socialising and I now do enjoy just a couple of glasses occasionally and that's enough. It's been a complete lifestyle change for the better and is easy enough to follow through on your own, with the will to do it! If you are thinking of working with Kelly, just do it! It's easy, just do what Kelly tells you and it will really work! I feel more energised, sleep better, have no sugar cravings and have a greater zest for life! Kelly can change your life. Thanks, Kelly for your motivation, support and help! ​I have just completed the 1 month 1 to 1 with Kelly and can honestly say it was really easy! Having the menu’s laid out for me so all I need to do is the shopping is brilliant – I found once I had done the shopping the easiest thing to do was to portion out the meat/fish etc and put it in the freezer so its easy to find and you know what you are working with. The weekly phone call is a boost and daily texts or emails are encouraged.My husband also enjoyed the meals and said that he didn’t feel like he was on a diet – always a bonus – but I did do his meals a little larger than mine. At the end of the 4 weeks I have been sleeping better and clothes feel MUCH better – I have lost 10lbs and 6.5 inches and do not feel like I have had to make any sacrifices. I would definitely do this again – especially before/after a holiday or special occasion. It sure wasn’t what I expected but I did want to make a change and hoped Kelly would be able to do that, perhaps through motivation and a version of what I was eating already which did appear to bad... at the time! I thought giving it a month to try something new was worth doing. The best parts of the coaching was having regular opportunities to check out my questions on the food plan and to have someone giving me encouragement. Knowing Kelly would call me Monday mornings helped to keep me on track. I think it is worth saying that I did not appreciate how much my eating would change, strangely I did not appreciate the sugar free element, how naive was I! On one hand I missed the variety in terms of no longer grazing all day on fruit, but within the first week, I was no longer eating fruit, no longer 'searching' for something 'healthy' to eat during the evening. Instead I was eating three big meals a day full of greens and protein and not eating between meals. I did not have much weight to lose and indeed lost the half stone in the four weeks, I am leaner and have energy, fruit is not the emery but there is now a balance. I don't 'pick' and my taste buds have changed and to top it all I am no longer missing bread. I have days off, I still enjoy a drink over the weekend but I don't have any problem switching back into the Rutherford of healthy food. Thank you Kelly! I started on KSFL in August 2016 on one of Kelly's online plans. I then joined the Wednesday classes at Coppice. sugar was the hardest for me as I have a sweet tooth. I also craved a cup of tea but was determined to see how my body felt without caffeine. I could of had decaffeinated tea/coffee but I choose to try herbal tea. Kelly was always available daily for advice, guidance and support when I needed it. What I like about KSFL is it's not about the calories or what you weigh on the scales. Kelly talks a lot about your mindset, how your body feels on KSFL, hormones, gut health, alcohol, and many more topics that affect weight loss. By the end of January 2017, I had lost 28inches and 3stone in weight. The main change was how I felt, I have more energy, clearer skin, and I feel more healthier and happier in my self. My journey still continues, still caffeine,dairy and gluten free. The sugar will always be a battle, but Kelly has given me lots of healthy recipes which are great . Thank you for all the support Kelly! I should like to say a big, big "thank you " to you for your help, support and encouragement over the 12 weeks as I feel fitter, healthier and more energetic as a result of the course. Your enthusiasm is infectious Kelly and I think you're great! 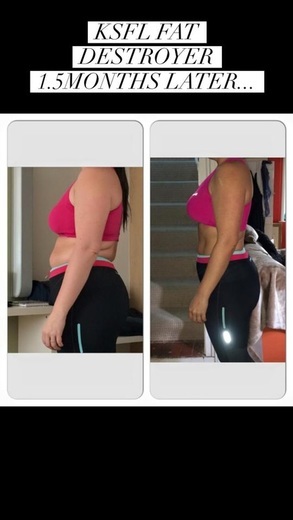 I started on kick start with Kelly on the 12 week plan. I didn't expect the results that I got and would recommend it to everyone. The biggest challenge, for me, was the no snacking. And to be honest I still struggle with this but try to make good choices. However, kelly reassured me all the way through and helped me cut back. The first thing I noticed was the amount of energy I had. I have two young kids so need to keep going from dawn to dusk. The second thing I learned was not to look at the scales so much. I was obsessed with this at first but ended up focusing on being healthy and inch loss, I lost a total of 12.5 inches in 12 weeks! Kelly I would just like to say a BIG THANK YOU for helping me during my month’s one to one coaching, I feel that the support you gave me every day was brilliant and my weekly coaching call really helped to keep me on track, I went throughout a different time in my life, with my daughter moving to University and without your support, I feel I would have given up on my own diet, as you know I have re-booked a place in a couple of months to give me another boost. Doing the plan made me realise how easy the meals can be and how it does fit into my busy lifestyle, I was even cooking my lunch whilst cooking my breakfast and was still not late for work; previous to this I simply had a smoothie for breakfast and a salad for lunch. I stuck to the plan religiously and I am amazed at how much my taste buds have changed, I now have to have salad leaves – before the plan I would have them but leave them on my plate, I’ve also tried different cheeses and love them and I have learnt to eat foods cold and to realise- that’s ok.
As you know, during the month’s coaching I lost one stone and 10 and half inches, but I also had lots of compliments about how “fresh” I looked and how much my eyes were sparkling. My sleeping was better and I had much more energy. 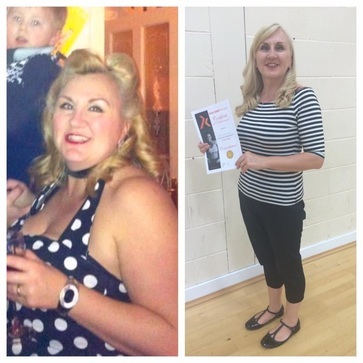 Overall, doing the coaching gave me confidence in my abilities to succeed and also an awareness of portion sizes, I now enjoy eating lots of spinach and kale and realise the value of these to your diet. Kelly I would also like to thank you for altering the meals when I didn’t like what you had suggested –I did give everything a try, and have found some lovely new foods I like, but I did describe smoked salmon, eggs and asparagus as bush tucker trail !!!!! Kelly thank you once again for your help, support and guidance, you are an inspiration to me and I look forward to working with you again soon.